China – Shenzhen’s Happy Valley Amusement Park, having celebrated its 20th anniversary in October, is still going strong, receiving over 30 million tourists from China and overseas in that time. The Park wanted to make some special changes for its anniversary, to keep the experience fresh, and decided that a sound reinforcement upgrade was the way forward. Ultimately they chose a Martin Audio WPC line array. Happy Valley is China’s first domestic amusement park chain, with seven locations across China and an eighth opening in 2019. Happy Valley, having previously worked with Budee and Martin Audio on its Chongqing park, once again decided on the same partnership, this time for its flagship venue. The Shenzhen park is a leader in the ever-growing Chinese theme park industry and has regularly been voted top attraction by most visitors. 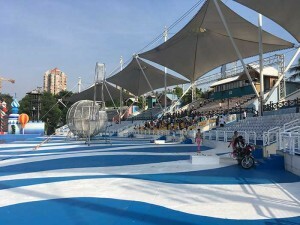 The park looked to upgrade its Water World sound stage, where a flexible system that could be used for a variety of shows was required. The multi-resolution options that exist in Martin Audio’s Wavefront Precision offered the ability to easily adjust, based on a show’s size. The digital optimisation provided by Martin Audio’s Display software guaranteed the Pacific Budee technical team could guarantee the sound quality across the audience coverage area. 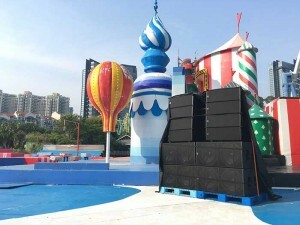 Happy Valley chose to go with a system comprising 16 WPC speaker elements and eight SX218 subwoofers, which could be integrated in different formations. The system is driven by Martin Audio’s new state-of-the-art iKon amplifiers.